An ancient divergence among the bacteria. Balch WE, Magrum LJ, Fox GE, Wolfe RS, Woese CR.J Mol Evol. 1977 Aug 5;9(4):305-11. Classification of methanogenic bacteria by 16S ribosomal RNA characterization. Fox GE, Magrum LJ, Balch WE, Wolfe RS, Woese CR. Proc Natl Acad Sci U S A. 1977 Oct;74(10):4537-4541. Phylogenetic structure of the prokaryotic domain: the primary kingdoms. Woese CR, Fox GE. Proc Natl Acad Sci U S A. 1977 Nov;74(11):5088-90. Now Woese, Fox and others in Woese’s group had been leading up to these publications in ways for years (I note, there were some pretty incredible people involved in these studies in the years before 1977 too including Mitch Sogin, now at MBL, David Stahl, Chuck Kurland, Norm Pace, etc but that is another story). They had been determining the nucletide sequences of small fragments of rRNAs from different species, especially from different organisms that did not have nuclei – the so-called “prokaryotes”. And they were using these sequences to infer the phylogenetic relationships among these microbes. Consider for example, the paper by SJ Sogin et al in 1972 “Phylogenetic measurement in procaryotes by primary structural characterization. Sogin SJ, Sogin ML, Woese CR. J Mol Evol. 1971;1(1):173-84. This paper laid out some of the arguments for why rRNA sequence information might re-write our concepts of classification of prokaryotes. From this and many of the other papers from Woese and Fox and others before 1977 it had been shown that one could use rRNA sequence information to more accurately infer relationships among “prokaryotes” than had been done previously with other types of information. Today this notion that we can use sequence information to infer the evolutionary history of microbes is taken for granted but back in the early 1970s it was not. And in addition, many people probably just did not care too much about the exact details of microbial phylogeny and classification. But this changed in the 1977 with that series of papers outlined above. What these papers showed was that hidden beneath everyone’s noses was a separate, previously unknown, major split in the prokaryotes into two distinct lineages. One of these included all the standard bacteria people were familiar with like E. coli and B. subtilis and one of them included some pretty weird wacked out bugs that thrived in extreme conditions. For example, look at the phylogenetic tree from Fox et al. The Bach et al. paper has similarly interesting, cool nuggets. However, alas, it is not available in PubMed Central as are the other two papers here I am not focusing on it. What is great though is that the other two papers are freely available to anyone to read in Pubmed Central and also at the PNAS web site. Yay for access. Too bad the other paper is not freely available. ABSTRACT A phylogenetic analysis based upon ribosomal RNA sequence characterization reveals that living sys.tems represent one of three aboriginal lines of descent: (i) the eubacteria, comprising all typical bacteria; (ii) the archaebacteria, containing methanogenic bacteria; and (iii) the urkaryotes, now represented in the cytoplasmic component of eukaryotic cells. In this paper they lay out the evidence for the existence of at least three main branches in the Tree of Life. Interestingly, for the phylogenetically minded people out there, they do not show an evolutionary tree in the paper. What they show is what is known as a similarity matrix (the inverse in essence of the distance matrices many people may be used to seeing) where a score is given for the similarity between organisms in the fingerprints of their 16S/18S rRNAs). From this table, Woese and Fox infer the existence of three primary branches in the tree of life. This is laid out in a few paragraphs starting with one at the bottom of page 5088. A comparative analysis of these data, summarized in Table 1, shows that the organisms clearly cluster into several primary kingdoms. The first of these contains all of the typical bacteria so far characterized …. (lots of names here) … It is appropriate to call this urkingdom the eubacteria. A second group is defined by the 18S rRNAs of the eukaryotic cytoplasm-animal, plant, fungal, and slime mold (unpublished data). … (They call this lineage the urkaryotes). Eubacteria and urkaryotes correspond approximately to the conventional categories “prokaryote” and “eukaryote” when they are used in a phylogenetic sense. However, they do not constitute a dichotomy; they do not collectively exhaust the class of living systems. There exists a third kingdom which, to date, is represented solely by the methanogenic bacteria, a relatively unknown class of anaerobes that possess a unique metabolism based on the reduction of carbon dioxide to methane (19-21). These “bacteria” appear to be no more related to typical bacteria than they are to eukaryotic cytoplasms. Although the two divisions of this kingdom appear as remote from one another as blue-green algae are from other eubacteria, they nevertheless correspond to the same biochemical phenotype. The apparent antiquity of the methanogenic phenotype plus the fact that it seems well suited to the type of environment presumed to exist on earth 3-4 billion years ago lead us tentatively to name this urkingdom the archaebacteria. Whether or not other biochemically distinct phenotypes exist in this kingdom is clearly an important question upon which may turn our concept of the nature and ancestry of the first prokaryotes. Mind you, the whole paper is worth reading, but those three paragraphs lay out a revolution in how one thinks about the tree of life. Now admittedly, some of our notions of the tree of life have changed since 1977 and there is much more of a feeling of mixing and merging between branches than was appreciated back then. And some definitely feel that the archaebacteria (or archaea as they are known today) are not per se a third branch in the tree of life but rather than there are four or five major branches and that archaea may not in fact be a “monophyletic grouping”. But whether you think archaea truly represent a third branch in the tree of life or not, this paper fundamentally altered how we think about the tree and about microbes. The work was even written up in the New York Times and got a lot of press (not that that is proof of anything – but it got microbial phylogeny into the public’s mind). With the identification and characterization of the urkingdoms we are for the first time beginning to see the overall phylogenetic structure of the living world. It is not structured in a bipartite way along the lines of the organizationally dissimilar prokaryote and eukaryote. 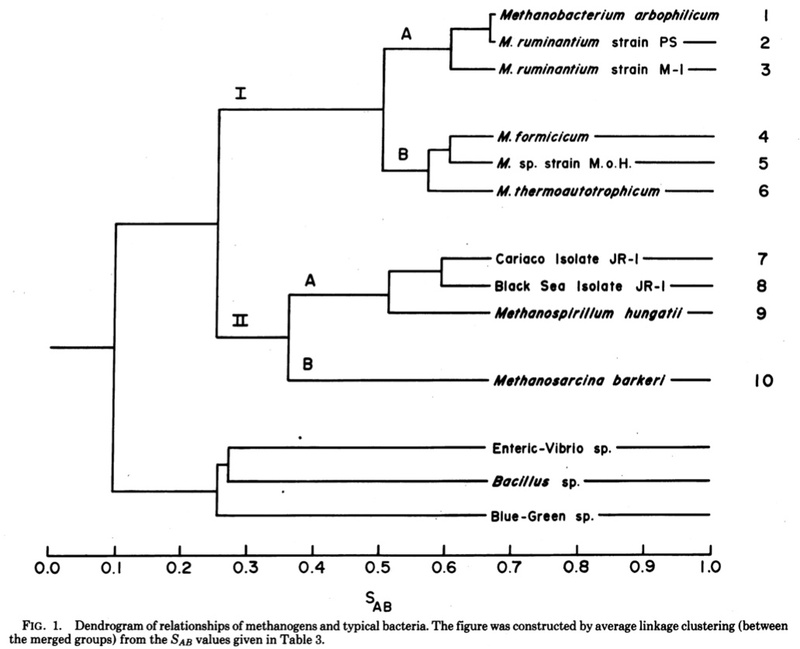 Rather, it is (at least) tripartite, comprising (i) the typical bacteria, (ii) the line of descent manifested in eukaryotic cytoplasms, and (iii) a little explored grouping, represented so far only by methanogenic bacteria. that contains talks from the 2007 Archaea and Evolution symposium, including Norm Pace, Ralph Wolfe, Mitch Sogin, and many more. A very nice series of talks, the videos unfortunately do not do it justice (they leave out the many great arguments that popped up throughout the series!). Also, just wanted to add, (possibly ironically based on your and czimmer's recent tweets on the paper) I'm now collaborating with David Clayton (he of the songbird genome paper). Small world! Note regarding the songbird genome – I did not say anything critical of the paper – I was just pointing out that Zimmer was not overwhelmed by the paper. I did make a little tongue in cheek post about his post where I coined a new term “Yet another genome sequence – YAGS” but I never specifically said anything about the finch paper. Speaking as a guy who doesn't generally care about phylogenetics, I agree that this work was very, very cool. I'm also amazed at how much you improved Table 1 of Woese & Fox by drawing those three boxes! Jonathan, thanks for the clarification re: the finch paper. Hope you find the links I posted somewhat useful. How much evidence contradicts the viable alternative to the Three Domains, ie. that Eubacteria are parahyletic, and Archaea+Eukarya diverged relatively late from a bacterial lineage? I'm just puzzled by the nearly unanimous acceptance of the Three Domains without any solid rejection of the alternatives; seems like I missed something, would like to catch up! I stand by this. I think this paper and the ones leading up to it and shortly after it are / were spectacular regardless of whether they archaea (or any of these three groups they outline) are monophyletic and whether or not they represent full domains of life. They key to these papers are that they fundamentally altered how microbiologists and importantly, non microbiologists, think about microbial evolution. Clearly, with genomic data and with better methods and with consideration of lateral gene transfer, etc, we have some different perspectives now on archaebacteria, urkaryotes, and eubacteria. But I think focusing in on whether they were exactly correct or not is the wrong thing to do. They provided many fundamentally important insights (e.g., the presence of major splits within the prokaryotes; the need for the use of molecular data in prokaryotic phylogeny; and many more). So if a new paper came out tomorrow showing some convincing evidence one way or another regarding the deep branches in the tree, and the archaea were found to not be as novel as they claimed, I would still think this paper and the ones surrounding it, were the most important ones in the recent history of microbiology. Totally agree w you about the importance though; revolutionary both in using a molecular approach and in recognising prokaryotic diversity. Classic papers don't have to remain correct to be awesome. I agree with your assessment, especially now you have qualified it as in *recent* history of microbiology. I guess the papers that launched the discipline from Koch and Pasteur and Cohn must rank highly too! I was still at high school in 1977, so these papers passed me by at the time. But I do remember coming across Woese's 1987 review on Bacterial Evolution in Microbiology Reviews, shortly after specialising in microbiology and it blew me away. I can still remember the moment when I first saw it in Bart's Hospital library! In fact, it was one of those Chapman's Homer moments, when a whole new landscape became visible with the realisation that bacteria had evolutionary histories and a phylogenetic taxonomy just like plants and animals. I almost said the 1987 paper was the most important. I carried that with me everywhere I went for years — and I still have my original. All marked up. I love it. I wonder if the Woese papers didn't do something even more revolutionary — introduce evolution into microbiology? Before them, sections on classification in textbooks of microbiology divided “bacteria” into discrete groups, the non-purple thises, the anaerobic thats, the non-beta gram-positive others, and so on. All based on the reactions of these groups to various stains and based on aspects of their metabolism. There wasn't a tree in sight. I remember about 1980 in my university's Department of Microbiology there was a very good Microbiology student, John Gosink, who used to come to me to ask about how one inferred phylogenies. Back in his own department, he then gave lectures to the faculty to bring them up to speed on that. Since then they've gotten heavily into reconstruction of trees of prokaryotes. I suspect there were similar processes going on at other universities. All this because Woese (and Mitch Sogin) caught their attention. Up till then, I don't think you will find microbiologists having any interest in phylogenies. Or is this an exaggerated cartoon of the modern history of microbiology? I agree completely. It's also worth noting that Mitch Sogin and other big names in microbial evolution (such as Norm Pace and Erko Stackebrant) were products of Carl's lab — it wasn't a Wallace/Darwin simultaneous thing. I think pre-1977 microbiologists didn't think microbes had an evolutionary history that could be investigated — or maybe it had not even occurred to them that microbes had any evolutionary history. I think that in addition to the great microbiologists of the late 1800s, we should also tip our hats to the researchers of the Luria-Delbrück-Lederberg era who discovered that microbes had genetics and that you could study it. Those three discoveries (late 1800s, mid-1900s, and the work of Woese et al.) are the great steps forward in understanding the biology of microbes. Joe – completely agree about Luria and Delbruck, Lederberg … have written about them too but not in the context of microbiology per se. See my post Classic papers in genetics and evolution that are available in Pubmed Central – Paper 1 – Luria and Delbruck on the origin of mutations for example. Next Next post: Coming to UCDavis, 4/23, @RebeccaSkloot discussing #HeLa book "Immortal Life of Henrietta Lacks"